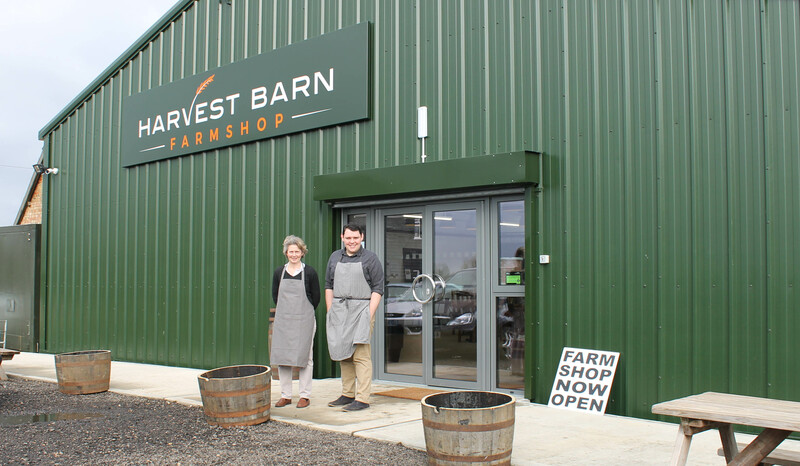 The successful launch of a family-run farm shop and café that was three years in the making has been made possible thanks to a £41,000 LEADER grant. The grant will also support the establishment of an educational centre on site, due to complete this summer. Harvest Barn is a long-awaited addition to Whitehall Farm, which has been run by the Briggs family for over 10 years. In less than two months since opening, the store – located on Ramsey Road near Farcet in Peterborough – is already attracting over 200 visitors each weekend. Staying true to the family’s passion for fresh produce, Harvest Barn stocks a variety of locally grown and sourced products, including Whitehall Farm’s own apple juice and oats. This is all alongside a family friendly café that serves a selection of sweet and savoury treats for hungry visitors. The family farmers want to inspire an interest in farming amongst school children and the shop’s visitors, alongside supporting older students of agriculture and environmental sciences. With that in mind the second phase of the grant will also help fund an educational centre, which is expected to open in the summer, and help provide farm access so visitors can see the produce growing in the fields and meet some of the farm animals. A further £750,000 of grant funding is still available from The Rural Peterborough and Rutland LEADER programme, but only until March 2019. The programme has already supported six projects based in the Rural Peterborough and Rutland area but wants to use up all its funds to help develop the area’s rural economy. The programme is being delivered by Opportunity Peterborough with support from a Local Action Group (LAG) made up of 14 local volunteers from a variety of sectors and professions. The LAG approve funding for projects with the aim of improving the overall prosperity of the area. Lynn Briggs, owner of Harvest Barn, said, “We had been planning to open a shop for three years but financing was always a barrier. Without support from the LEADER programme I don’t know how we’d have got this off the ground. “It’s been a dream to sell direct to customers. The soils here create fantastic produce – why would we want to give that to someone else? We’ve also got a great location near a busy road so it’s a perfect pit stop for anyone travelling. Steve Bowyer, chief executive of Opportunity Peterborough said, “This is a clear cut example of just how big a role LEADER funding can play in supporting the rural economy, and it’s a brilliant testament to the hard work of the Briggs family and their team that Harvest Barn has achieved such quick success.